Just a Melbourne girl, from the Yarra Valley, heading over the hill and running for charities. After gaining a little more confidence in my ‘cake marbling’ skills, I decided to attempt a ‘Chinese’ version for my family using the classic combination of Green Tea and Black Sesame! 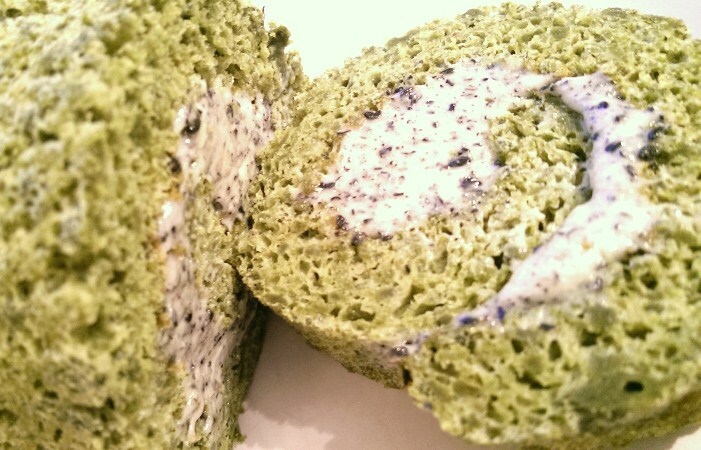 I have previously posted ‘Green Tea and Black Sesame Swiss Roll‘. Using a ‘Victoria Sponge’ recipe that my mum passed onto me, I have tried to create a lighter version of the traditional ‘marble pound cake’ by using a ‘chiffon cake’ style method. This basically involves getting as much air in the eggs as possible and then folding in a small amount of flour to hold it all together. 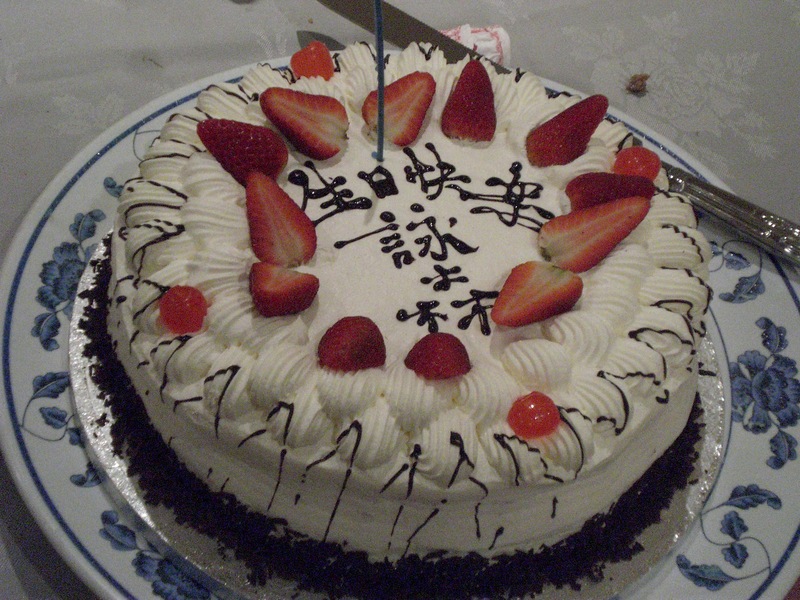 There is also less sugar which is typical of Chinese cakes. Now carefully pour both batters into a lined and greased cake tin. This is difficult with this cake batter as it is very runny! The way I did it was to pour the batters into the corners and let them run into the middle so you get a chance to at least get 4 definite colour blocks. Finally swirl a skewer or knife through the mixture a couple of times to create the ‘marble’ effect. This cake was a hit with my family, not too sweet and very light in texture. A definite keeper! The month of November is a busy one. Full of birthday celebrations for both my friends and family so plenty of reasons to bake, and eat, lots of birthday cake! This cake was for my cousin who can EAT! It is her 25th birthday and she loves black sesame as much as me. 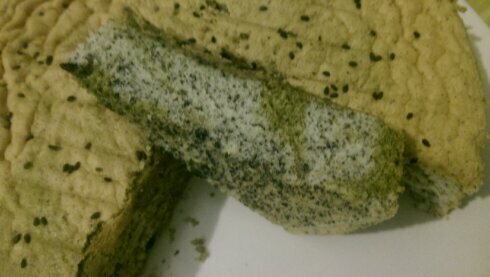 I’ve been thinking of new ways of incorporating the delicious taste of black sesame into other desserts after successfully trying out the Green Tea and Black Sesame Swiss Roll. Trawling the internet I was able to find a few recipes, and settled for this recipe for Black Sesame Yoghurt Mousse Cake as the photos looked particularly inviting. I have mentioned in previous posts that ‘Chinese’ style cakes tend to have very light sponge and a less sugar than typical British cakes. Before we started making our own birthday cakes my family would often go to the Chinese bakery in China Town and buy one of the cream and fresh fruit cakes. They are deliciously light and always look amazing! Birthday Cake with my name miss-spelt! I think my 25th birthday was the last time I got a shop bought cake, since then my mum has been making them every year instead. I’m not sure if I noticed this at the time, but the baker spelt my name using the wrong Chinese character! As you can see, lots of cream and decorated with fresh fruit. When baking this Black Sesame Yoghurt Mousse Cake I wasn’t too keen on the idea of yoghurt so decided to use mascarpone cheese instead. This meant that the filling would be similar to that of a no-bake cheesecake, which was I found a little confusing as this wouldn’t really give the light airy mousse texture that you would expect from a ‘mousse cake’. 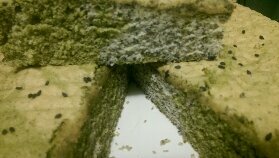 So I had a quick look for other recipes and found this Green Tea Mousse Cake recipe which looked a lot closer to what I’m wanting to achieve. However the filling is made from raw egg yolks (as expected for a mousse) and with my sister currently pregnant with my future niece, this was a no go area! 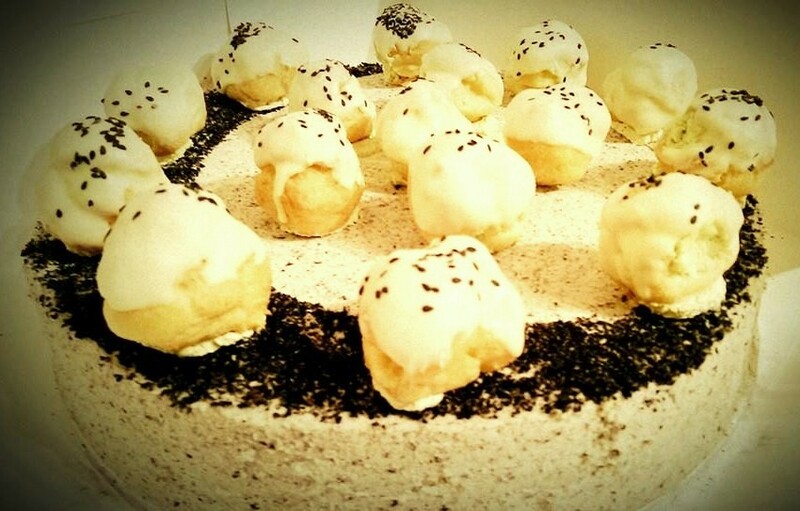 So I settled for using the cake batter recipe in the Green Tea Mousse Cake (substituting the green tea powder for black sesame powder) and the cream filling recipe from the Black Sesame Mousse Cake recipe (substituting the yoghurt for mascarpone) . However this was only the beginning of many challenges! So I figured that I had plenty of time to bake this cake on Sunday afternoon, so I wandered down to the supermarket after a leisurely breakfast (of more emergency breakfast muffins) and bought all the ingredients for this cake. I bought extra cream and mascarpone thinking that I could make a cheesecake later on in the week. Then I started making the cream filling… this is where things went very wrong! I’m not very experienced in using gelatine in baking and this was a major hurdle to overcome for this recipe. The first attempt at adding the cooked gelatine to the cream and mascarpone mixture it seized, solidifying and creating jellied lumps throughout the mix! DISASTER! All the filling had to be thrown into the bin. I absolutely loathe wasting food, so this was not good for my baking stress levels! Thankfully the second time all went well, that is until I realised that I’d used up all my Black Sesame Powder! I managed to find a packet of whole black sesame seeds and ground them up in the spice mill into a powder but the results weren’t as fine as I needed it to be. 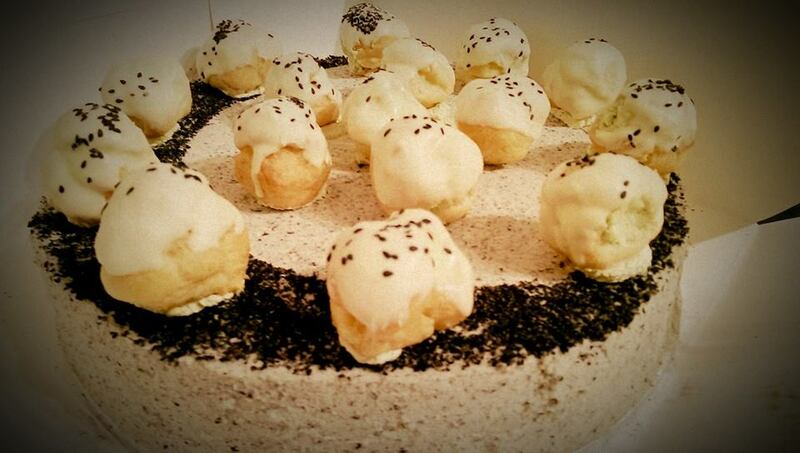 I was planning on filling these profiteroles with the black sesame custard cream from the green tea and black sesame swiss roll recipe, but having run out of black sesame powder I opted for a contrasting flavour by using green tea (matcha) powder instead! 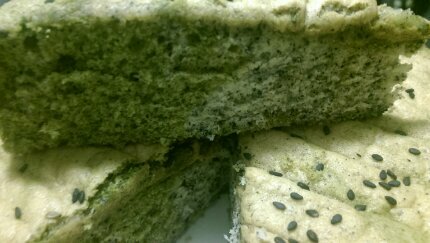 Green tea and black sesame seem to be a very common and pairing, so the flavours should go perfectly well together. To make my life easier, I have just used whipped cream flavoured with a little sugar and matcha powder. Don’t work with gelatine! But if you need to, then follow packet instructions without defaulting in any way! Make sure you stock up on double, no triple, the amount of ingredients needs in case of baking disasters. 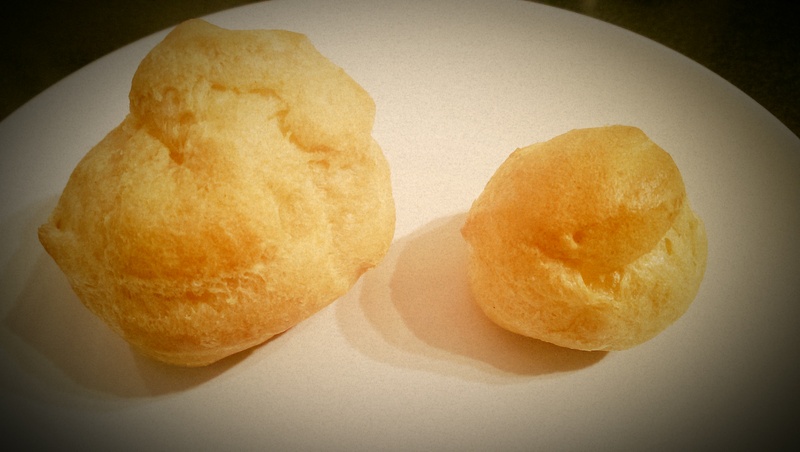 You can make profiteroles with bread flour too! Yay! Judging by the empty plates and the small left over piece of cake, I think all that hard work was worth it in the end! The sponge was light and soft. 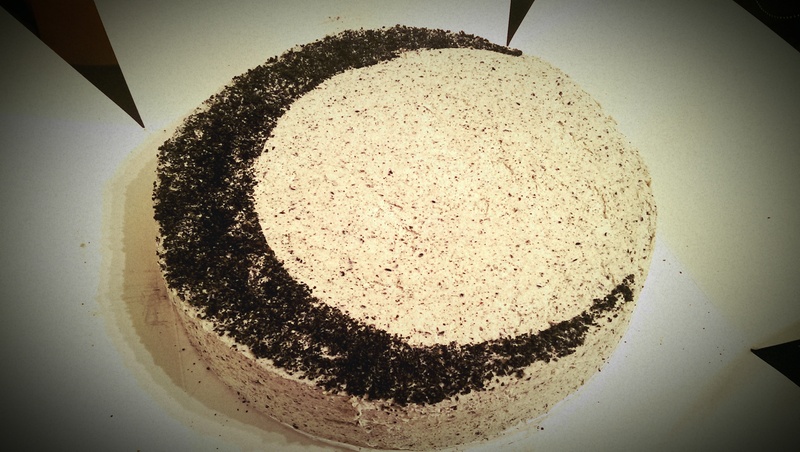 The cream was not too sweet and the black sesame taste was not too strong. I’ll definitely make this cake again, but maybe once I’ve forgotten the initial drama of the first time round! The positive health benefits of green tea are well known throughout the world, but are you also aware that black sesame seeds are a good source of antioxidants, protein, iron and magnesium? 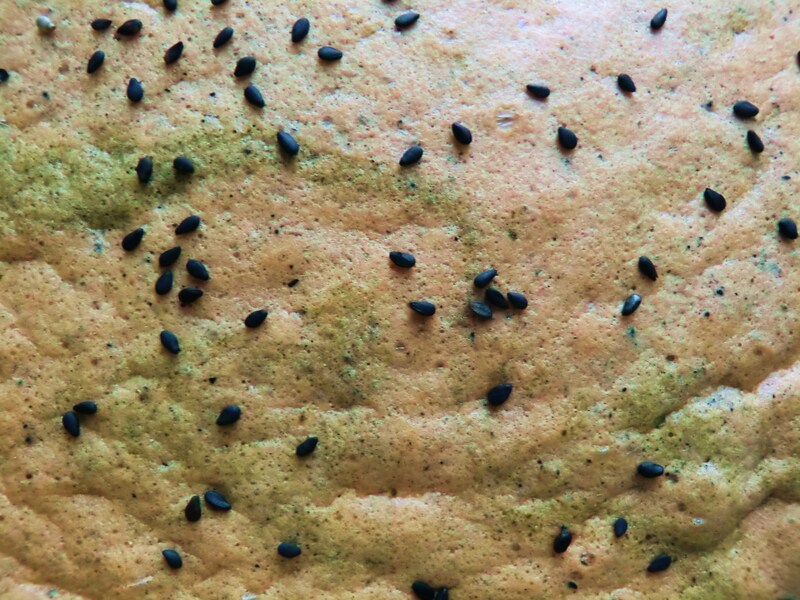 Black sesame seeds are not hulled unlike the more widely used white sesame seeds, hence the difference in colour. The retention of the outer shell means that there is 60% more calcium in the black sesame seed and the flavour is also stronger. Plus my mum also tells me that black sesame helps to keep your hair black and shiny, so what’s not to love?! 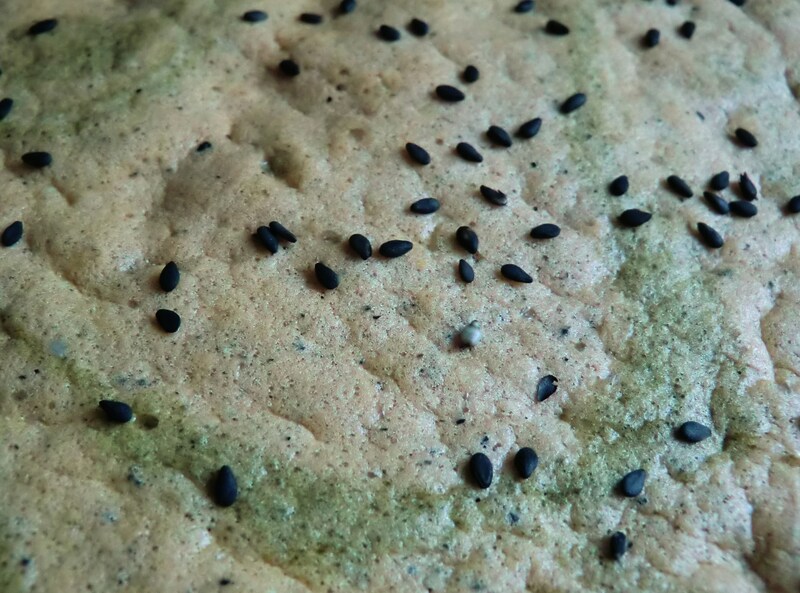 Chinese people love to use sesame in desserts, both varieties. There is a “Sweet Black Sesame Soup” sweet black sesame soup that is widely found all over China, and black sesame paste is often used as a sweet filling in pastries and cakes. I’ve found that ‘Chinese’ and ‘English’ cakes are vastly different. Chinese cakes use a lot less sugar and oil/butter and flavours are usually more subtle. Texture and lightness in the sponge is very important, so chiffon cakes or Genoise sponges are much preferred. With English cakes, anything goes! I love dense tea cakes with lots of different flavours and plain Victoria sponges that show off the buttery cake with simple decoration and fillings. Both have their positives, but marrying the two styles is even better! Black sesame is often paired with green tea (matcha powder) or sweetened red beans (adzuki beans). A quick internet search and hundreds of recipes can be found. On a trip to the Chinese supermarket earlier this week, I saw a tempting array of Chinese cakes.These often come in the form of Swiss rolls or plain chiffon cakes. A green tea Swiss roll with a butter cream filling caught my attention, but I managed to avert my eyes and walk away. However the cake still remains in my mind, so I’ve decided to make one instead. To get the green tea flavour, I’ve added 2 table spoons of matcha powder. In hindsight I should have taken a couple of table spoons of flour out as the mixture became quite thick so the sponge wasn’t as light and airy as it should have been. Noted for next time! The filling is a kind of buttery custard, and the black sesame powder I used came through brilliantly. I could have just eat the lot with a spoon and a cup of tea, but made do with eating the left overs straight from the bowl instead!